A two-year Arizona institution with a film school recently went public with details about its screening room. Scottsdale Community College runs a two-year hands-on program that features courses in sound design, story theory, pre- and post-production and screenwriting, among many other courses. Last year, the college opened a new space where people can watch movies, television shows and other creations of its students. 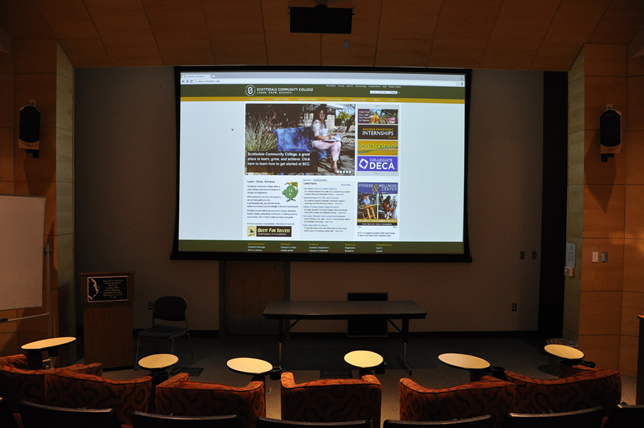 Scottsdale Community College's new screening room includes 9.1 surround sound system, a large format display, and a Sony VPL-FHZ55 professional-grade laser projector. The screening room was opened in the school's Film School Hub building, which also houses classrooms, a computer lab, production studios, collaboration rooms and an equipment storage "cage." The new screening room includes 9.1 surround sound system, a large format display, and a Sony VPL-FHZ55 professional-grade laser projector. The college worked with Troxell Communications to outfit the room. As college Media Coordinator Justin Johnston said in a press release, the company "implemented a strategy to meet both our product and timing requirements to complete this project within all of our required parameters. The result is outstanding."